Like the original poker, “4-Line Jacks or Better” hunts for the best hand in order to win big. There is, however, one major format detour in this variant. As its name suggests, the game uses four lines of cards that also use four different decks (consisting of 52 cards apiece). This means that players’ winning odds are increased substantially as they can win in any or all of the four lines altogether. 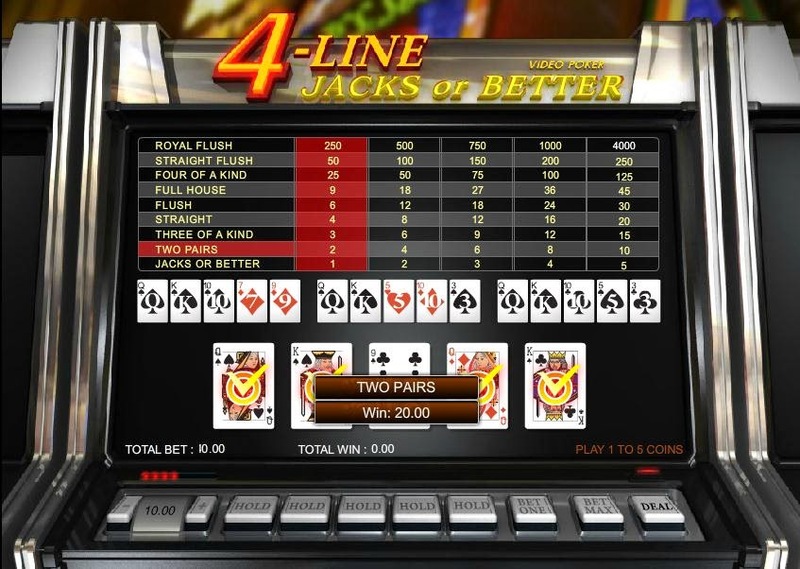 This online game requires players to have at least one pair of Jacks. The grades are based on the pay table and punters may decide to discard up to five cards but replace them only once. They can do this by manually clicking on the “HOLD” buttons which are found right below the cards. The win is calculated based on the hand payout multiplied by the coin value. This, however, can still be increased through the “Doubling” round (optional). In the Doubling round, punters are given three options to manage their bankroll—to COLLECT, to DOUBLE, or to DOUBLE HALF. This side game automatically appears on the game window every after a win. By clicking on COLLECT, players decide to not proceed with the round and put all wins into their bankroll. By clicking “DOUBLE,” they decide to use their winning into the side bet; they may also half this value (to lessen the risk) by clicking DOUBLE HALF. By winning this round, players get to significantly bolster their win in the main game. The side game aims to draw a card of higher value than the Dealer’s. Each doubling bonus round, a new 52-card deck is used for every doubling instance. The Dealer will draw a face-up card and player is dealt 4 face-down cards to select from. This option is allowed until the players’ winning amount exceeds the Double Up Limit. For more information about this game, register an account with 12BET.